We're getting into that time of year where we have to make shifts in our skin regimen. Winter is all about hydrating with ultra-moisturizing products. But, as we transition to spring, we must be mindful of our skin's changing needs. In staying true to the goal of replicating perfectly poreless skin by summer, I've decided to incorporate a product that can refine the skin & eliminate imperfections each and every single day. If you don't have this product in your current line up, you might be truly missing out. I've discussed the importance of exfoliating in the past. Exfoliating, in my opinion, is just as important as cleansing. We won't' go a full day without removing surface dirt and oil, but what about the dead skin clogging up your pores? Even though I'm the number one advocate for daily exfoliation, I didn't do it often as I should. That all changed when I discovered acid based toners. These toners have one job, to refine and perfect, by dissolving dead skin cells, with each and every use. The result is brighter, more even-toned skin that looks baby smooth and reflects light beautifully. When your skin naturally reflects light, it glows. For acne prone skin or if you're suffering from discoloration, acid-based lotions shouldn't be an option.....it's a must. If your current regimen doesn't include this miracle skin-refining tonic, here are a few options for you to consider. I was watching a Youtube favorites video the other day when the girl held up a bottle of Glossier's new multi-acid acne exfoliator. She said something that immediately made me want to purchase. "Since using this solution, I've been able to go without any foundation." She then went on to explain that she appeared foundationless in the video. Because she did her brows, lips and wore mascara, I assumed that her skin had some coverage as well. Once I learned the truth, I hopped on over to Glossier's website and purchased. Another reason why I was so eager to buy was because of some before & after pics of people who made incredible improvements to their skin, thanks to Solution. The product description promises to transform your skin in 4 weeks with the help of several acids including glycolic, salicylic and lactic acid. I can't wait to try and share my first impressions. Ever since I learned that Pixi Glow Tonic was a staple in Jourdan Dunn's skin regimen, I wanted it. Jourdan, when speaking about Pixi Tonic, said that it "exfoliates very well" and the acid refiner was "really doing its job." 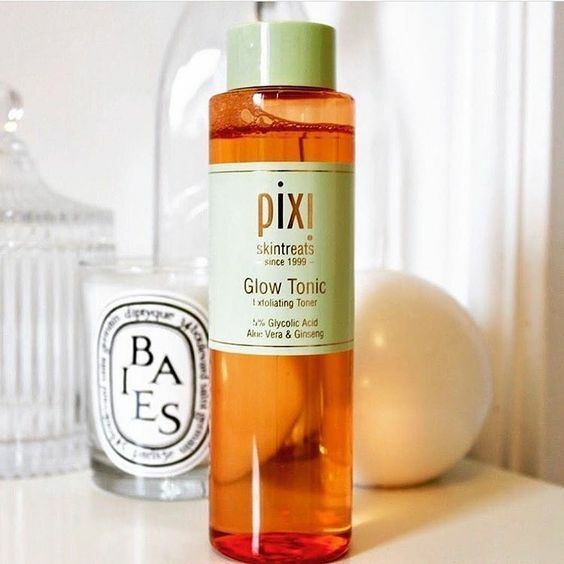 Before Glossier Solution came along, Pixi Glow Tonic was everyone's favorite. It's also got a great supporting cast of ingredients including witch hazel, ginseng, glycerin, and castor oil. If your skin isn't acne prone, but you're looking for something to exfoliate lightly on a daily basis, Pixi Glow certainly fits the bill. 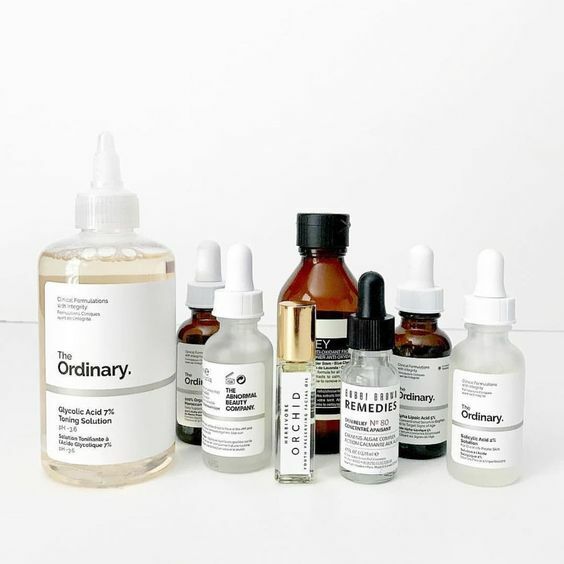 ORDINARY'S GLYCOLIC ACID TONING SOLUTION. Ordinary is a newcomer on the scene. This brand is blowing up because of its high quality, low-cost lineup. They offer a 7% glycolic acid toner in a full 8 oz size at an affordable price. That's if you can get your hands on it because they frequently run out of stock. Their toning solution is definitely worth a try because at, this price you can afford to use it on your neck, chest, and anywhere else that you want to promote even-toned healthy looking skin. 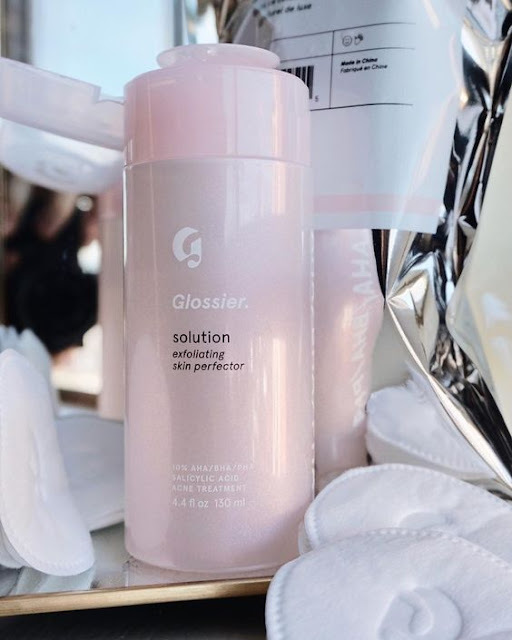 Of the three, I decided to start my collection with Glossier's Solution. Part of the reason was because I also picked up their Boy Brow since a lot of people I follow were raving about it. It's already starting to warm up where I live and I've seen some signs that my skin wanted to freak out. My skin was acne free all winter, out of nowhere, a pimple shows up. No thanks. 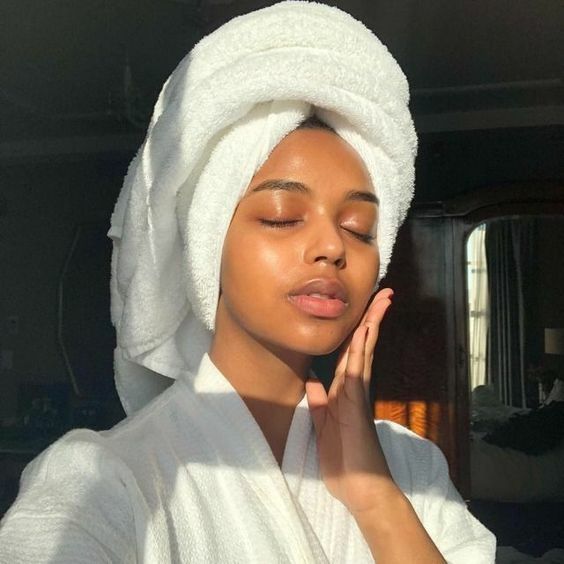 I'm getting proactive and detoxing my skin's outer layer so, as my oil production increases with warmer weather, I don't suffer from breakouts as a consequence. Acid toners kill the bacteria that feeds acne and help with the healing process. One facialist even hinted that acids help prevent deep scaring because of how they aid in healing. I didn't even mention how acids can also lessen the look of fine lines and wrinkles. Even toned, smoother skin is possible simply by swiping your face with a little acid toner on a routine basis. Not to mention that acids prep the skin so that everything else you use afterwards becomes more effective. Who wouldn't want that!? There just are too many benefits to pass up. I may have to try Glossier. I’ve been using The Ordinary’s Lactic Acid for a little over a month and today my aesthetician said she could tell my skin was smooth and less dry.